Treatment depends on where the cancer is and what stage it was in when it was diagnosed. Metastatic cancer is cancer that has spread beyond the organ where it originated to other organs in the body. If kitty has been diagnosed with metastatic cancer, its effect on her will depend on where the cancer is and how it has spread. Cancer, uncontrolled cell growth that disrupts body function, can be contained in one part of the body or it can metastasize, traveling through the blood stream or lymphatic system to form growths in other parts of the body. Cats are vulnerable to a variety of cancers, including squamous cell carcinoma, lymphoma, mammary carcinoma, mast cell tumors, oral squamous cell carcinoma, soft tissue carcinoma, osteosarcoma, respiratory carcinoma, intestinal adenocarcinoma and pancreatic and liver adenocarcinoma. Some cancers, such as osteosarcoma, are more likely to metastasize than others. Cancer can affect any tissue in the body, so it's difficult to know exactly what signs to look for. Each cancer will have a different effect, so there is a wide range of potential symptoms. Many cancers take a long time to develop and will usually have vague symptoms such as loss of appetite, weight loss and low energy level. Signs for common metastatic cancers can include lumps or small bumps under kitty's skin, weakness, sores or wounds that don't heal, unexplained bleeding, gastrointestinal disorders, changes in behavior and changes in the eyes. Metastatic liver cancer symptoms include jaundice and swelling in kitty's abdomen. Seizures and neurological disorders are common signs of metastasized brain cancer. Metastasized bone cancer symptoms include bone fractures and pain. If you notice changes in kitty, let the vet take a look to rule out other illnesses taht have the same symptoms. The earlier cancer is diagnosed the more treatment options are available and the better the prognosis. Cats with cancer have three options for treatment: surgery, radiation and chemotherapy. Surgery is effective only in cancers that haven't metastasized, however. Radiation also works for localized tumors, particularly tissue that can't be surgically removed. Chemotherapy is an option for the cat that has cancer in multiple areas of the body. However, it's not curative: It's meant to slow progression while maintaining kitty's quality of life. 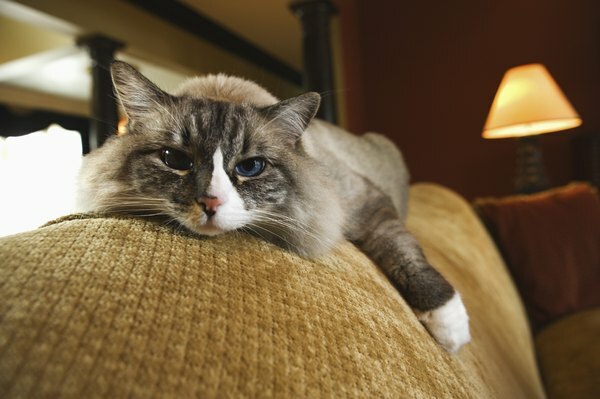 As with humans, cats can experience side effects such as loss of appetite, diarrhea and vomiting. If kitty has metastatic cancer, the main thing to keep in mind is her quality of life. Make sure you talk to your vet and have a clear understanding of what kind of cancer she has and what you can do to keep her comfortable. Treatment options are dictated by different things, such as the availability of treatment, the progression of the illness, Kitty's tolerance to treatment and financial constraints. Ultimately, your goal should be to improve your cat's quality of life. Be sensitive to ensure that her treatment doesn't cause her increased suffering. PetPlace.com: Feline Cancer: What Are the Warning Signs? Feline Advisory Bureau: Cancer in Cats (1): What Is It and What Are the Common Cancers in Cats? Pet Cancer Center: How Does Cancer Spread in Cats and Dogs? Can Canine Scabies Spread to Cats?